Speed Limit is another band that has been missing in action from the recording studio for sometime. The Austrian band's last album was 2010's Moneyshot, and that came after an even longer 18 year absence. 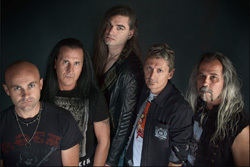 Now the band returns with their fifth album, Any Where We Dare, and two new members: drummer Hannes Vordermayer and vocalist Manuel Brettl. Even more, Speed Limit has changed or, perhaps better, returned to their early Eighties roots. 2010's Moneyshot could best be described as melodic hard rock in an AOR wrapper. Today's Any Where We Dare finds the band returning to their NWoBHM beginnings. The songs within in this album are definitely closer to melodic heavy metal if not, at the very least, heavier melodic hard rock. Notably, the riffs are stronger and sharper from twin guitar harmony and the rhythm section more assertive and powerful offering, at times, quick pacing. Both of these elements give many of the songs a large and epic sound. Yet, within and underneath the melody, harmony, and groove of hard rock remain and rise, as do the vocal arrangements. Manuel Brettl has strong, dutifully assertive, yet melodic presence. With some slight moments of moderation, from the gate, Speed Limit delivers some heavy and bracing metal. Sober Truth, Step Out Of The Line, Dealing With Danger, and the title cut, which starts the album, are some of the more assertive heavy metal songs here. Alternatively, some moderation comes with No More Ace To Play which varies both tempo and heaviness. Sign Of The Times is something of a metal anthem. Beginning with acoustic guitar and slight keyboards with vocals lilting above, it develops deliberately to a swollen guitar solo. Affinity Of Souls, the closing number, is a genuine rock ballad, featuring voice, vocal harmony, and whistling over acoustic guitar. 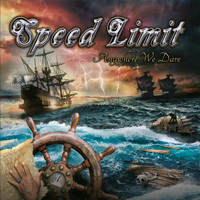 All in all, in light of their previous album, Speed Limit's Any Where We Dare is a refreshing return to its NWoBHM melodic metal origins. Hopefully their fans will embrace it. Recommended.